The Wanderers Hostel i Shkoder, Albania: Bestill nå! 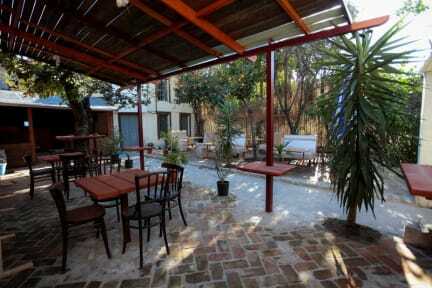 The Wanderers Hostel provides a social and comfortable atmosphere in a historic home. We are located within minutes of the city center on one of the most beautiful streets in the city! 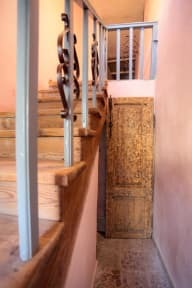 Our family has owned this home for generations and recently renovated the entire thing, including two large gardens in the front and rear appropriate also for cyclist entering and resting. A comfortable open lounge, outdoor bar and guest kitchen. We are located less than 5 minutes from the historic city center and bus station on the road called Gjuhadol ('joo-ha-dol'). We are even closer to the main road with historic buildings, bars and restaurants, called Pedonale ('Peh-doh-na-lei'). Beds and entire rooms are available, plus free breakfast, free wifi, cheap laundry machine, bikes to rent and all the Albanian hospitality you can handle. Each mattress and bedframe is brand new. Bed rental includes a locking cabinet large enough for multiple bags. Rooms are spacious and airy. The Wanderers Hostel Policies and Conditions.